Welcome to the two hundred and forty-ninth of my blog interviews with novelists, poets, short story authors, biographers, agents, publishers and more. Today’s is with novelist, humorist, short story author, columnist and writing guru Jane Wenham-Jones. A list of interviewees (blogged and scheduled) can be found here. If you like what you read, please do go and investigate further. Morgen: Hello, Jane. Please tell us something about yourself and how you came to be a writer. Jane: It started when I was at home with a small baby, my brain slowly atrophying. A writing aunt sent me an entry form for a short story competition. With some effort I finished an entire story and sent it off. It didn’t win. Morgen: But that didn’t put you off (thankfully). I find with everything that doesn’t get anywhere (she says, as if I submit loads!) that I still then have the story (usually written especially) to send somewhere else so a lose / win. 🙂 What genre do you generally write and have you considered other genres? Morgen: Please don’t, although do if it gets you writing more. 🙂 You’ve had four novels published – can you please tell us what they are? 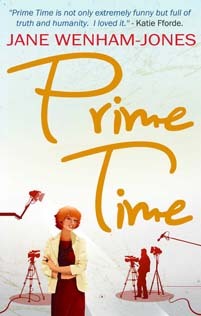 In order of publication date they are Raising the Roof, Perfect Alibis, One Glass is Never Enough and my latest – just out – please buy it – is Prime Time. and thereby sets the tone. 🙂 Jane, can you remember where you saw your first book on the shelves? Jane: I’m sure I used to cook… These days, I have to say I don’t do it much but I enjoy the odd encounter with the kitchen I do have. My recipe in this book is for an egg sandwich! Morgen: My MP (well, next town but one) is Louise Mensch (neé novelist Louise Bagshawe) so I’m sure she’d say “yes”. 🙂 You’ve written two successful ‘how to’ books: ‘Wannabe a Writer?’ and ‘Wannabe a Writer We’ve Heard Of?’ – were these projects that you created (perhaps because of your novels?) or were you approached to create them? Jane: It was my own idea – coming off the back of my agony aunt column for Writing Magazine. Journalism started from writing novels – I got into it first to publicise the books – so yes I guess everything has sprung from there. Jane: I think they’re enjoying a bit of a resurgence actually. I write a regular column – Just Jane – for Woman’s Weekly Fiction Special and they’ve just gone to 12 issues a year. Morgen: Ah, yes. I did notice that, and People’s Friend went from fortnightly to weekly a while back so that’s a good sign. Also I think eBooks are making fiction shorter. You have regular columns in Writing Magazine and Woman’s Weekly, as you just mentioned – how did that come about? Morgen: Good plan. 🙂 What do you think the biggest mistake that aspiring writers are prone to make, perhaps subconsciously? Jane: Writing for themselves instead of remembering they are there to entertain their readers. Morgen: (ideally both?) Do you have an agent? Do you think they’re vital to an author’s success? Jane: Yes and Yes, they certainly help. I didn’t have an agent for my first two books but I am extremely glad I have one now. Morgen: It is getting more difficult to secure one. How much of the marketing do you do for your published works or indeed for yourself as a ‘brand’? Jane: A lot of it. You can’t just sit back and rely on the publishers to do it for you. They often simply don’t have enough time. Morgen: They don’t. Things have changed in the past few months (years?) and (from memory) I’ve only had one interviewee say they have the luxury of letting the publisher promote while they get to do the actual writing (if only). Have you won or been shortlisted in any competitions and do you think they help with a writer’s success? Morgen: Yet. 🙂 I met you last July at the Winchester Writers Conference (my first time – and I loved it), where you were the after dinner speaker. You seem a very outgoing person, do you ever get nervous public speaking? What advice would you give someone who has to give a speech / talk about their writing? Jane: Reinvent yourself! And it gets easier the more you do it. Do read that section in ‘Wannabe a Writer We’ve Heard Of?’ Not just because I wrote it (!) but because it contains lots of tips from other writers about the whole publicity thing – as well as from me. <laughs> I love the bit about the Young Wives. 🙂 I touched on eBooks briefly, are your books available as eBooks? Were you involved in that process? And do you read eBooks? Morgen: I have a generic but do like the look of the new dinky Kindle. 🙂 What was your first acceptance and is being accepted still a thrill? Jane: My first ever was a short story for My Weekly – I was beside myself with excitement. Yes it is still a thrill – always. Morgen: (Mine was Woman’s Weekly :)). Have you had any rejections? If so, how do you deal with them? Jane: Of course I have. Depending how serious they are I cry, stamp, throw things, drink too much, eat chocolate, feel very sorry for myself…. But I always, always, then get a grip and send whatever it is, out again…..
Morgen: I’d love to be a fly on your wall. 🙂 What are you working on at the moment / next? Jane: Trying to catch up on my emails…. Morgen: Never-ending circle, I bet… if yours are anything like mine, which is lovely in a way but sometimes the pauses between ‘pings’ are bliss. 🙂 Do you manage to write every day? What’s the most you’ve written in a day? Jane: I do something work-related every day, even if it’s not contributing to an actual manuscript or column. My record was 9,000 words in 24 hours when I was racing the clock to finish Wannabe a Writer? Morgen: Wow. I’ve done that a couple of times for NaNoWriMo (not helped by leaving the last 48,000 words to the last eight days!) so I know how tiring that would have been (especially during a 21-hour day). What is your opinion of writer’s block? Jane: My friend Cari called it Writer’s Can’t be Arsed. We all get that – you just have to write through it. Morgen: Similar to crime novelist Mark Billingham’s reply when I interviewed him back in November. Do you plot your stories or do you just get an idea and run with it? Jane: A bit of both. Morgen: Snap. 🙂 Do you have a method for creating your characters, their names and what do you think makes them believable? Jane: I don’t have a method as such but I see them and hear them. Morgen: Me too. My favourite aspect of writing is now knowing what’s going to come out and I love ‘meeting’ new people, especially weird and wonderful ones. 🙂 Who is your first reader – who do you first show your work to? Jane: It depends. Particularly with columns or articles – sometimes I write and rewrite and tweak and fiddle endlessly – other times they pretty much come out whole and I just have to de-glitch them and send off. Jane: I make a cup of green tea with lemon. Morgen: I’m a Tetley One Cup. 🙂 Do you write on paper or do you prefer a computer? Morgen: If you’re anything like me, you’re much quicker than paper / pen. What sort of music do you listen to when you write? Jane: Radio Four – unless it’s a play that’s getting tedious or a “comedy” I don’t find funny. Then I switch over to Radio Two. Morgen: I’m a Radio Two fan (or Classic FM when I’m writing). Although I love Radio Four, I’m rubbish at remembering when things are on. 🙂 What point of view do you find most to your liking: first person or third person? Have you ever tried second person? Jane: Have written two novels in first, and two in third. Depends what the plot calls for really. Have never really understood what second person is! Morgen: I love second person (Wikipedia has a great explanation), my favourite point of view actually, certainly to write. It’s rarely used (and probably even rarer bought by editors) but I spotted a second person competition runner up recently; in Writer’s Forum Mag – judged by interviewee no.53 and writing friend Sue Moorcroft (who I’m seeing on Wednesday night (18th Jan) for the H. E. Bates competition prize giving, because (a) she was last year’s judge and (b) she’s bringing this years, Katie Fforde – it’s free entry and open to anyone who can get to Northampton’s Moulton Theatre that night – details on http://www.hebatescompetition.org.uk.) Sorry, back to why we’re here, 🙂 do you have pieces of work that you think will never see light of day? Jane: Not many – the odd rubbish short story. Morgen: Oh, I have loads of those. 🙂 What’s your favourite / least favourite aspect of your writing life? Jane: Favourite: Typing “The End”, seeing myself in print, looking at my little row of books on the shelf. Morgen: <laughs> I’m working on that one… although I’d really love to end up with a writer (am I mad?) so he’d have to be a successful one. What do you like to read? Any authors you could recommend? Jane: www.wannabeawriter.co.uk – naturally – and I admired both Anne Lamont’s Bird by Bird and Stephen King’s ‘On Writing’. Morgen: If I had a tenner for every time someone recommended ‘On Writing’ I wouldn’t need to marry a wealth author. 🙂 You’re based in the UK, do you find this a help or hindrance with letting people know about your work? …I like the S/Cally ideas generator (I guessed Cally would be Cally Taylor) and the S is Sally Quilford (interviewee no.144 :)). Sorry, keep getting distracted (slap wrist!). Where can we find out about you and your work? Morgen: What would be your ultimate writing ambition? Morgen: To get your own back, is there anything you’d like to ask me? Jane: How do you manage to be so wonderfully organised about this blog? Morgen: 🙂 As Jane mentioned earlier, her websites are www.wannabeawriter.co.uk and www.janewenham-jones.com. She also runs (with her able Developer Kevin) http://wannabeawriter.darkskipper.com/wp/events/2011/09/writing-for-pleasure-and-profit which details a writing workshop she is running next weekend (22nd January, with the offer of a get-together the night before!). Sadly I can’t make it (although I’ll not be all that far away) but this is part 2 of 4 so I hope to make parts 3 and / or 4 (dates to be advised). Jane is the author of four novels and two non-fiction books including the best-selling Wannabe a Writer? featuring contributions from a wide array of big name authors and journalists from Jilly Cooper to Frederick Forsyth to Michael Buerk. A lively and energetic speaker, she gives humorous talks and lectures on her life as a writer, her experiences of the buy-to-let market – which her first novel was based on, the art of self-publicity and achieving personal goals either as simple entertainment or for inspirational / motivational purposes. Thanks for the honourable mention. Thank you, Edith. x You’ve come to the right person; I design WordPress blogs for other people (including Jane) so just let me know what you need help with and I’ll email the instructions. New pages are on the same menu as blog posts but next one down (e.g. from the top bar, hover on your blog’s name and your Dashboard / Edit / New… menu will appear then hover over new and you’ll see Post / PAGE / Media / Link.